Two federal special agents are under review by U.S. Immigration and Customs Enforcement for sharing and showing approval of social media posts promoting unfounded, anti-immigrant conspiracy theories involving U.S. Rep. Ilhan Omar. 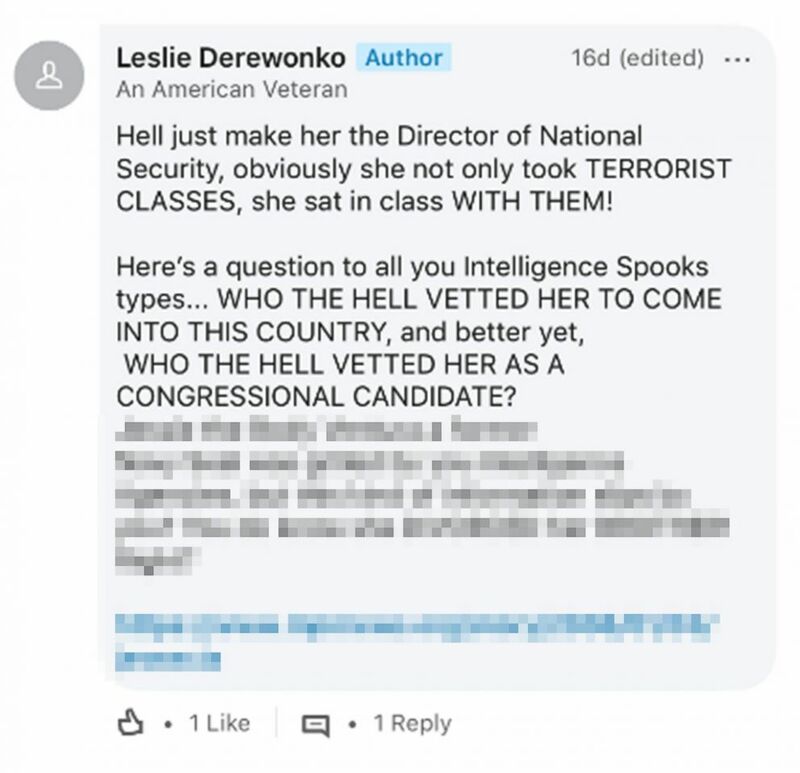 Leslie Derewonko, a Homeland Security Investigations senior agent, shared an inaccurate LinkedIn post with a video that suggested Omar took a class in which terrorism was discussed. ICE agent Leslie Derewonko's LinkedIn post promoting a misleading video of Rep. Ilhan Omar as seen in an ABC News screen capture from March 8, 2018. Derewonko has previously engaged in promoting obscure, anti-immigrant conspiracy theories on LinkedIn, according to an ABC News review of posts from his account going back several weeks. In sharing other posts, he used the term “White America” multiple times. Derewonko could not be reached for comment. Another special agent, who is based in the San Francisco area, liked the post first reported by BuzzFeed, as confirmed by ABC News. Both agents have since changed their LinkedIn accounts, taking down their association with ICE to more general descriptions of their careers. ICE doesn’t have a policy that dictates what employees can or cannot share on social media, but the agency confirmed Friday they are looking into the offensive posts. The agents could be found to have violated the department’s employee code of conduct. “Social media content posted by employees on their personal platforms should not be considered representative of agency policies or positions,” ICE spokesperson Jennifer Elzea said in a statement. ICE is reviewing the posts to determine if they violated other department policies. 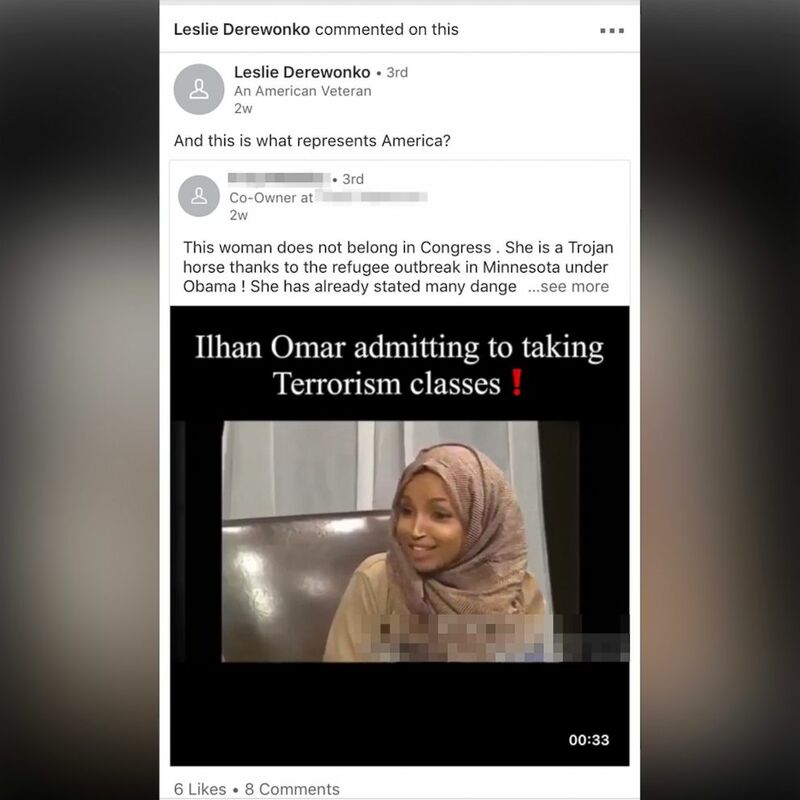 A screen shot taken by ABC News on March 8, 2018, shows special agent Leslie Derewonko's LinkedIn comment with anti-immigrant messages aimed at Rep. Ilhan Omar. However, Omar, one of the first Muslim women elected to Congress, has remained the focus of angry comments online, particularly among conservative voters. Democrats on Thursday passed a resolution that condemned all forms of bigotry and hatred including Islamophobia. The vote was the culmination of a week of party infighting over whether the resolution should also mention other forms of bigotry and came on the heels of comments by Omar that were criticized as anti-Israel. The measure passed 407-23, with 23 Republicans voting against it because they said it didn't go far enough in condemning Omar. Shortly after the vote, Omar in a joint statement with Reps. Rashida Tlaib and Andre Carson -- the other two Muslims currently serving in Congress -- expressed pride in the Democrat-backed measure. "We are tremendously proud to be part of a body that has put forth a condemnation of all forms of bigotry including anti-Semitism, racism, and white supremacy," the trio noted. "At a time when extremism is on the rise, we must explicitly denounce religious intolerance of all kinds and acknowledge the pain felt by all communities. Our nation is having a difficult conversation and we believe this is great progress."